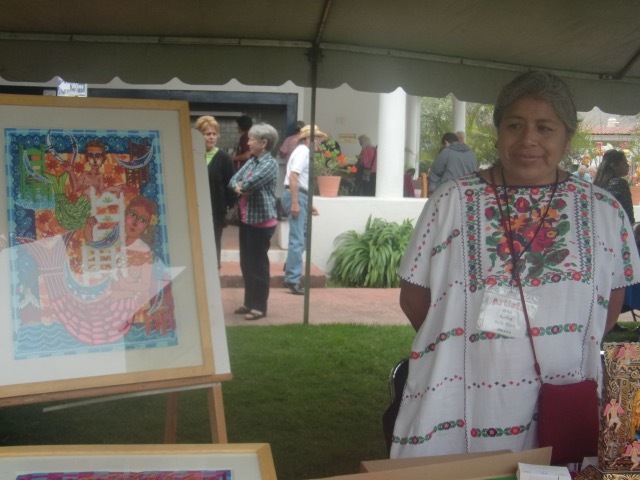 The 15th Annual Feria Maestros del Arte was held at the Chapala Yacht Club on November 11th through the 13th. Friday and Saturday it was from ten a.m. To five p.m. Sunday it was from ten a.m. To four p.m. The entrance fee was only 50 pesos and the money goes to the next year’s exhibition. 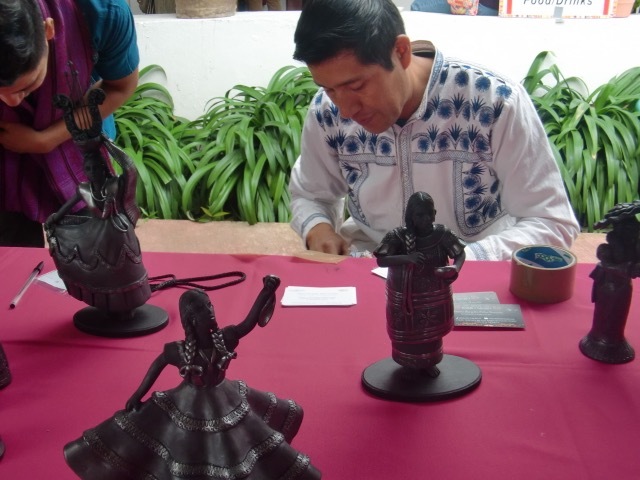 The purpose of this event is to keep the indigenous and folk art alive in Mexico. The modern world makes it more difficult every day for the hard working artists to compete with knockoffs quickly made for mass consumption and imported from other Countries. 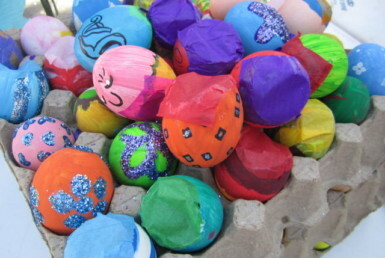 Once you see these beautiful works of art, you will never again be fooled or satisfied with the knockoffs. 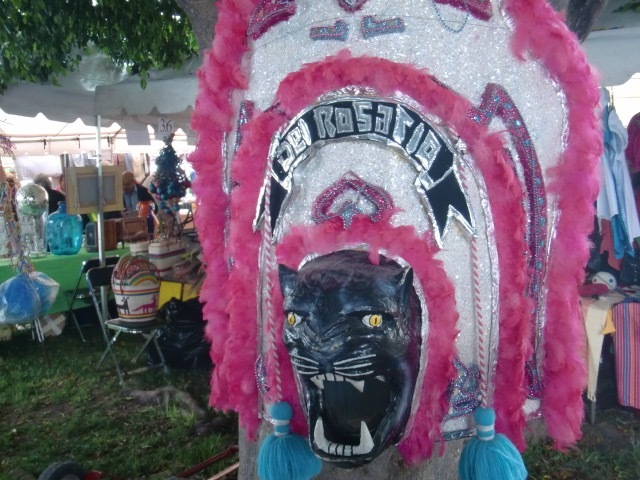 This mask in the above photo was at the entrance to the exhibit. It was so dramatic that it was the first thing people saw. I went on Friday and that was a very crowded day. I was planning on returning again on Sunday but the weather turned cold and rainy. There were crowds of people on Friday and it was difficult for me to get photos and impossible to get the artists to stand still long enough to talk about their work. So, this article is going to be just photos for you to enjoy. 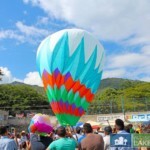 If you need more information, please go to their web site: feriamaestros.com. I have written down the different areas where the various works of art came from and how many booths. If I counted right, there were approximately sixty five booths. The interesting animals in the photos above and below are up from Oaxaca. 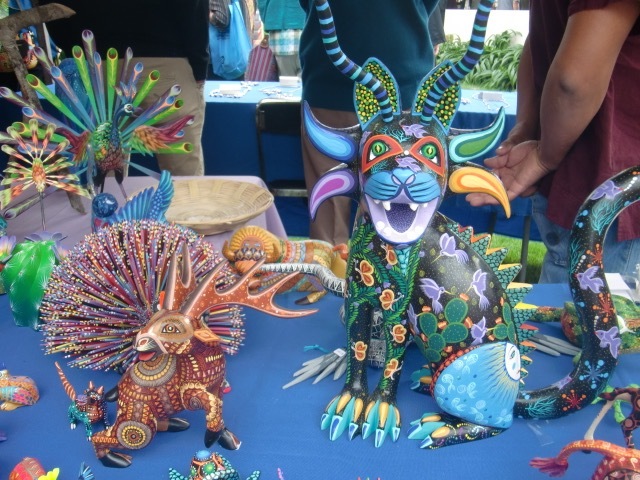 These carved wooden creatures are called Alebrijes. 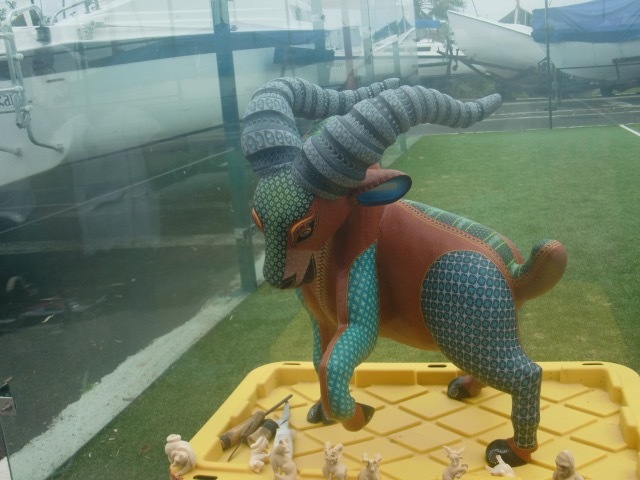 There were three different booths with these Alebrijes. Often these booths represent many artists. The next three photos are of different ceramics. Including the photo above. 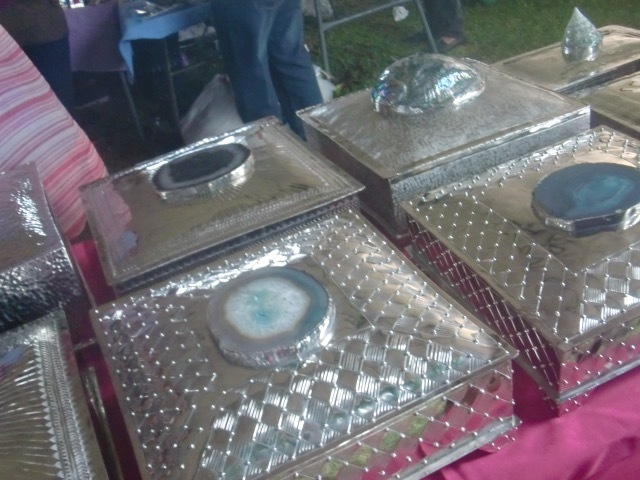 There were seven ceramic booths. 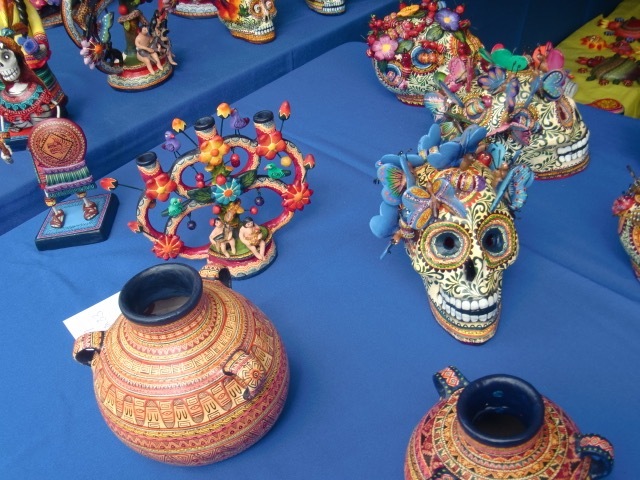 The artists came from Michoacan, Oaxaca, Puebla, Chiapas and Jalisco. I was fortunate enough to get a photo of one of the ceramic artists. He was finishing of one of his beautiful sculptures. Below is another photo of an artist at work. They must have tremendous concentration with all the activity of people around them, asking questions and wanting to buy their work. I admire them for being able to work under those difficult circumstances. 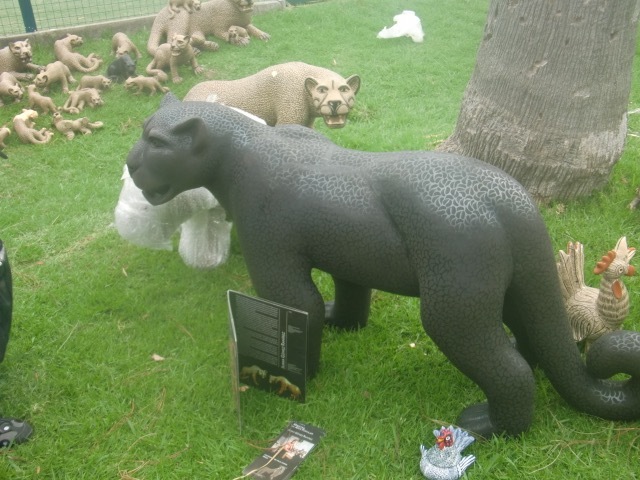 In one area of the yard were the very large and kind of scary looking animals made out of ceramics. 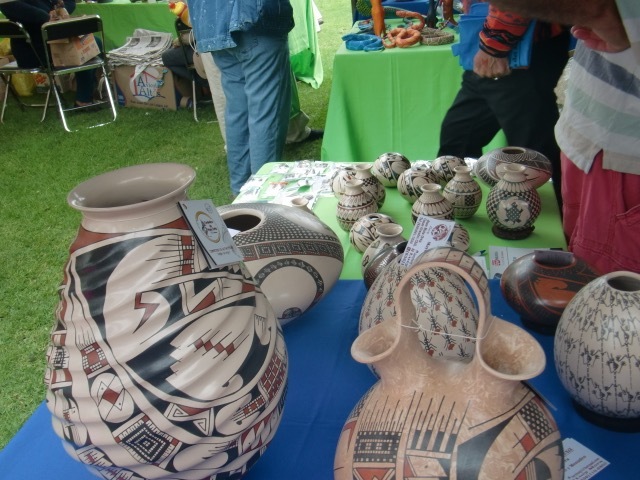 Seven ceramic booths represent far more artists. They all couldn´t attend so they sent representatives. 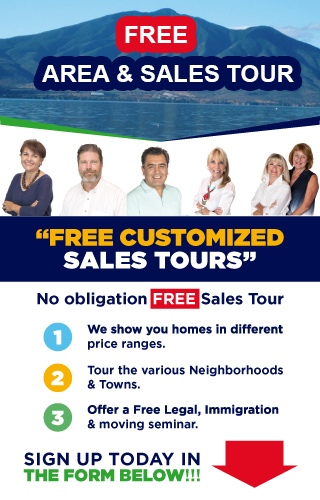 These representatives stayed with expats while they were here for the exhibit. 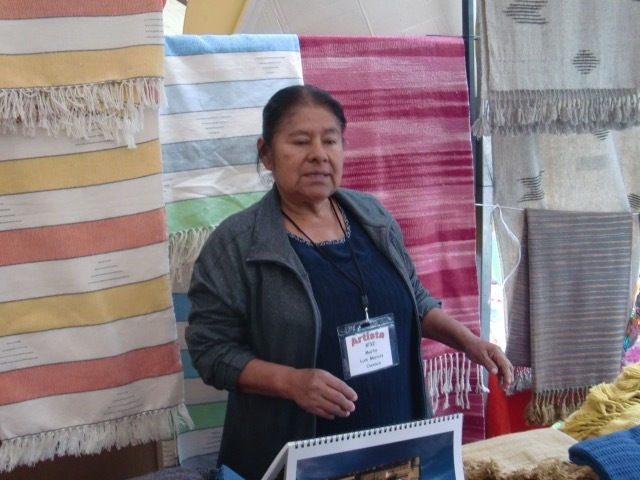 There were 21 textile booths. 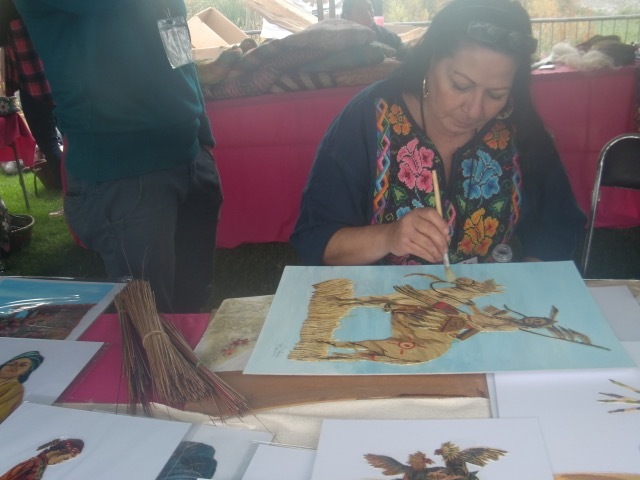 The artists came from Michoacan, Mexico City, Puebla, Oaxaca, Chiapas, Guerrero and Jalisco. Two of the artists are featured in the photo above and the photo below here. Unfortunately, it was impossible for me to get the names of the artists as it was so crowded. 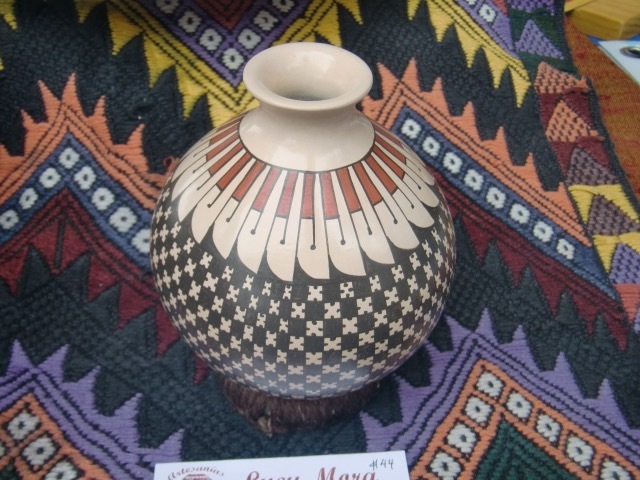 I enjoyed the way the pottery vase was displayed in front of the interesting textiles. 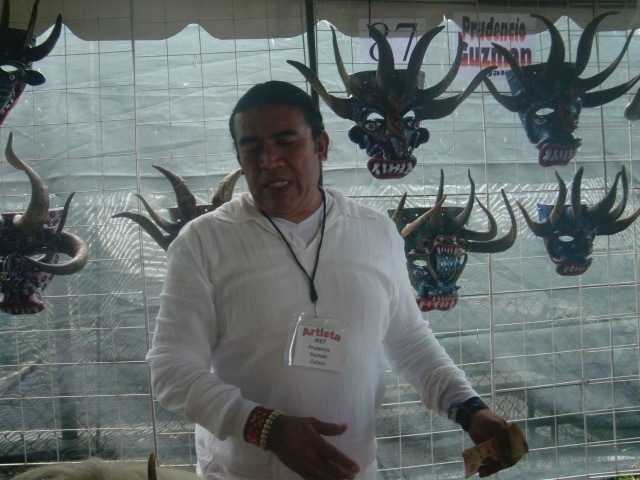 There were five different jewelry booths, from Oaxaca, Mexico City, Chiapas, and Jalisco. 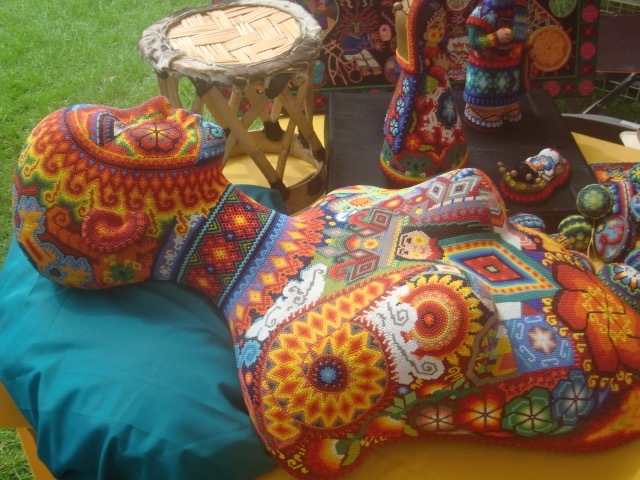 The beaded woman in the above photo is the work of the Huichol Indians. What a spectacular piece. 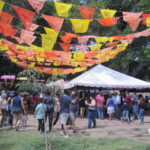 There were two Huichol booths. Both were artists from Jalisco. 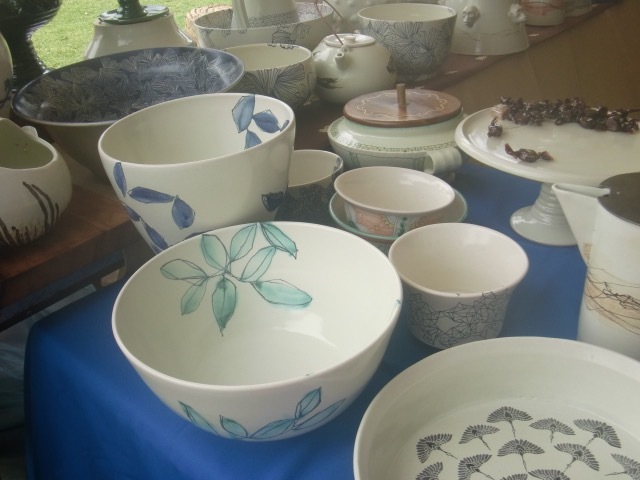 There were many beautiful pottery bowls. 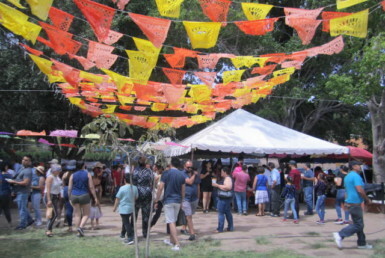 There were 12 booths from many different areas of Mexico, Jalisco, Puebla, Michoacan, Chiapas, Oaxaca and Chihuahua. The artist in the above photo made the interesting masks on the wall behind him.There were three mask booths. 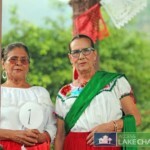 They were from Colima, Michoacan, and Jalisco. 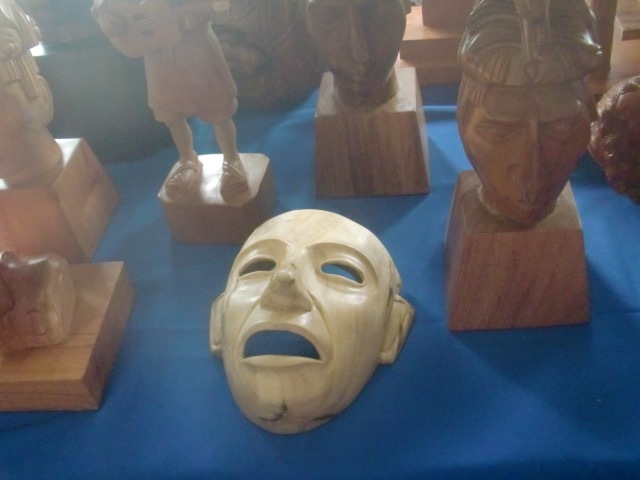 I really liked this wooden mask. It had so much feeling in it. There were two painting booths. 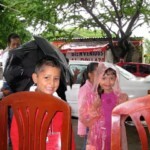 One of them was the Lake Chapala Society Children´s art. 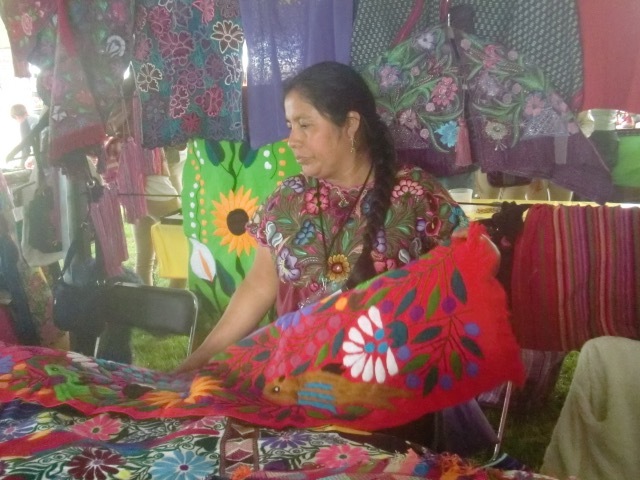 I asked the woman in the above photo if she was in the rebozo show which was getting ready to happen. There was always entertainment going on during the times the exhibits were open. Plus there was food for sale. It was another great show. I am so glad I went and actually bought a couple of things. 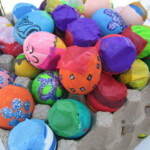 There were other kinds of art work that I didn´t mention. 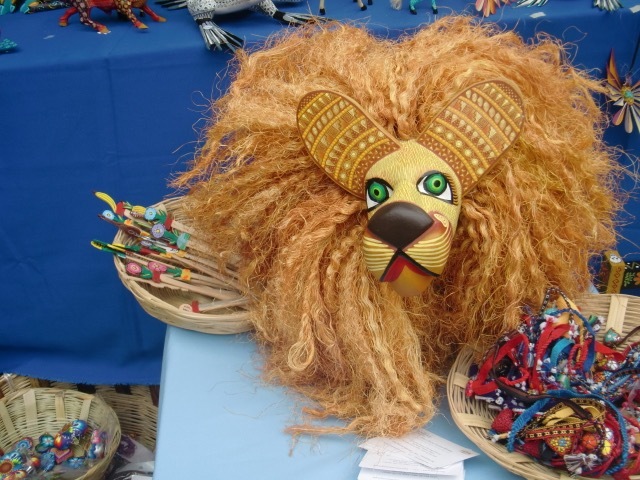 The beautiful dolls made by the women in prison, five metal booths, one booth of handmade shoes, five paper booths, one basket co operative from Sonora, one bone booth and I may be missing even more. Just too much to see and mention. Don´t miss it next year. Beautiful Beautiful Beautiful—–Human creativity at it’s best. 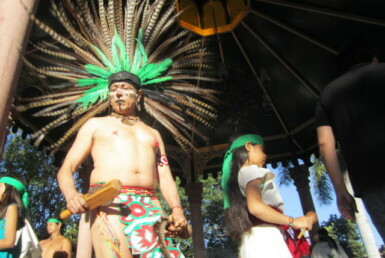 This is the premier art show in Mexico. 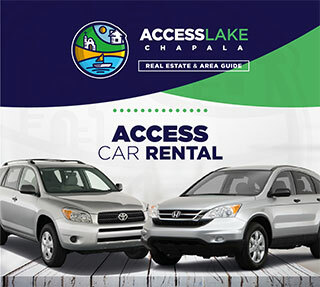 M. Carlson and her staff do an amazing job at getting the topnotch artists to Lake Chapala. I enjoy coming here every year and buying amazing art work. I bought two pieces at the 2016 Feria.